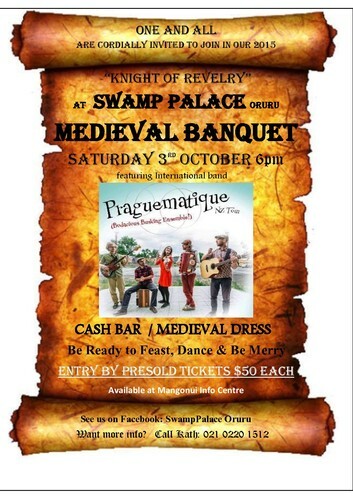 Come along all you Lords & Ladies, Wenches & Woodsmen, Huntsmen & Knights, Princesses & Peasants alike and any who fancy a night of Revelry, Medieval Style at our place in Oruru..the Swamp Palace. Wear your Medieval Garb and join in the festivities of a fantabulous Medieval evening. The night will include a sumptuous 3 course Banquet buffet, Theatrical entertainment and a live International 5-piece Band. Our minstrels & poets will entertain you in the initial part of the evening and then we have the incredible 5-piece Gypsy Troubadour band "Praguematique" who will play for all, on this night of all nights and dance you off your feet into the wee small hours. Role play is encouraged and there are Prizes for best Mens & Womens costumes. Our first banquet last year was sold out. Limited tickets available. An Oruru Inland Valleys Association Fundraising event. Tickets $50 each and are available from Mangonui Information Centre :09 4062046 or phone Kath on 021 0220 1512 to secure yours.